MAC has developed multi-element blocks of reference materials suitable for the compilation of a reference library of Auger sensitivity factors when used with the Auger Electron Microscopy (AES). (Auger electron: one of the electrons ejected from an atom as a result of the internal conversion of its own X-ray in the auger effect. Auger effect: a process in which an atom singly ionized by emitting one electron with energy in the X-ray range instead of emitting the usual X-ray photon on recovery undergoes a transition in which a second electron is emitted). A carefully selected range of elements or compounds will enable the surface analyst to compile a valuable reference library of spectra for those materials of specific interest to his field of study. AES is of particular value in the investigation of the surface chemistry of electronic materials. A set of 33 relevant reference materials is designed for this purpose. 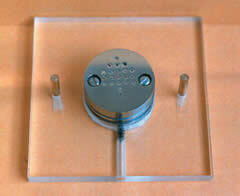 A Faraday Cup, for the accurate measurement of specimen current, is available as an option on all reference blocks. Multi-element blocks containing up to 50 reference materials can be made to suit the configuration of the most instrument but, the actual number of materials and the shape and size of the reference block is determined by the physical limitations imposed by the specimen holder and chamber. The reference material each has an exposed area about 2 square mm. Each block of reference material is made from AISI 304 grade austenitic stainless steel, set with elements and compounds of your choice and polished to a 1⁄4 micron diamond finish. All blocks are supplied with certificates of analysis and a map showing the locations of the reference materials.The design of the reference blocks for AES is based upon that used for the production of our already established range of electron probes X-ray microanalysis (EPMA) standard blocks. For EPMA, the reference standards are set into drilled brass blocks. However, for UHV, the brass would outgas, so non-magnetic stainless steel is used for the AES reference blocks. There is no coating of electrically conductive carbon on the AES blocks. For EPMA, this coating is needed to neutralize any electron beam induced charge. EPMA standards are mounted using epoxy resin, which would rapidly outgas under UHV conditions. The AES reference blocks are set with Wood's Fusible Metal. This is an alloy of bismuth, lead, tin, and cadmium. Wood's Metal, being electrically conductive, also serves as an electrical connection between the reference material and the stainless steel block thereby dissipating any electrical charge. However, some of the reference materials are electrical insulators, so there must be charge neutralized using a high specimen tilt angle or a lower primary beam accelerating potential. for a typical sample. Thus, the Wood's Metal is acceptable as a mounting compound for the blocks of reference materials. Electron Beam Damage: No appreciable electron beam induced damage of the Wood's Metal was noted despite prolonged exposure to a beam of 10kV and 0.3 micro Amps. detection limit of 1 atomic weight %. A comprehensive library of spectra could be used to establish the relative contribution of various elements in an unknown sample by the application of a peak stripping routine. associated with the charging of any electrically insulating materials must be taken into consideration before attempting this calibration). This ability to analyze an unknown sample using the E.D. system to gain prior knowledge of the elemental composition will ensure that the correct peak positions are set before depth profiling by AES. Acknowledgment: The investigation was carried out on a JEOL-10S by Dr. M.D. Hill of British Telecom Research Laboratories, Martlesham Heath, Suffolk. Make and model of instrument in which the reference materials are to be used. Specify quantity and reference materials required. Dimensions of the block (with drawing is preferred). Any limitation of the X and Y movements of the stage. Delivery is normally 3-4 weeks from receipt of the order. The block is comprised of 37 materials and a faraday cup.